One of the highlights of the annual Online Information Conference each December is the announcement of Information Professional of the Year, sponsored by the American Psychological Association. 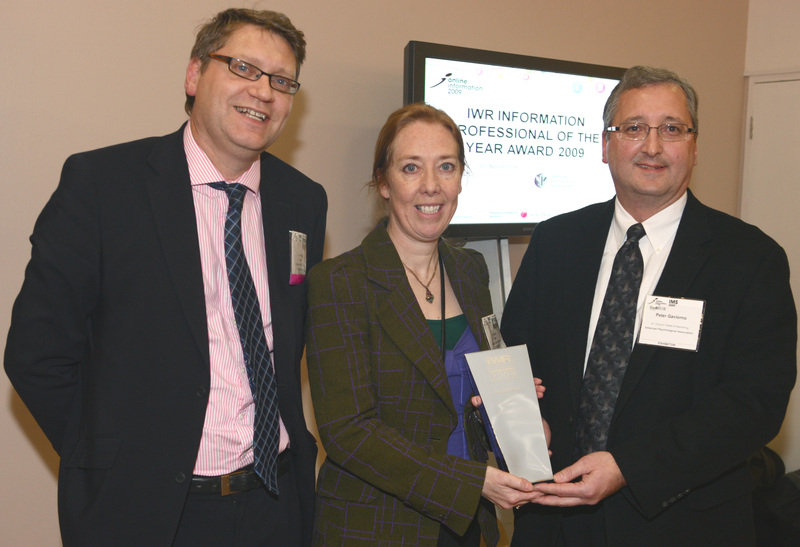 The awards are organised by Information World Review and the Online Information Conference organisers, Incisive Media. Nominations are judged by a panel of previous Information Professional of the Year award winners. This year Hazel Hall, Executive Secretary of the LIS Research Coalition, was named Information Professional of the Year. At a ceremony at London Olympia on Monday 1st December, Peter Williams, Editor of Information World Review, referred to Hazel’s “energetic and enthusiastic” contributions to the profession. He discussed how her work invigorates the professional landscape globally. He cited Hazel’s recent work with the Library and Information Science Research Coalition as an example of her achievements in 2009. Brian Kelly also noted the awards ceremony as one of the highlights of Online 2009 towards the end of his conference review.